Whisk Wednesdays: Where is my $%^& upload cord??? - Spork or Foon? Whisk Wednesdays: Where is my $%^& upload cord??? You know how Brad Pitt is starring in a movie called "The Curious Case of Benjamin Buttons"? Well, Teanna DiMicco (me) is starring in a movie called "The Curious Case of the Missing Digital Camera Upload Cable". I finally was able to get myself together and start up with Whisk Wednesdays again. This week was a Beef Stew of Lamb and Spring Vegetables. I did heartier vegetables in honor of the fall, so I used butternut squash, parsnips (are those a fall vegetable? All I know is that I didn't like them, and I'll never be cooking with them again, no matter what season), carrots, celery and potatoes. So I guess the only fall vegetable I used is the butternut squash. But it makes me feel like I'm cooking seasonally, so humor me. One thing I need to practice: the art of turning vegetables. Turning a vegetable is taking that vegetable and shaping it like a little, itty, bitty football, with seven sides. My vegetables ended up with three sides, five sides, eight sides - shall I go on? I never got one - not one! - seven sided football. My vegetables looked like that game I used to play when I was a kid where I had to fit the blocks through the corresponding holes of the box. You remember that game? Star goes in the star, heart through the heart... not for the geometrically challenged, I can tell you that much. I got frustrated. I cut myself. I remembered my new best friend and number one weapon: my creme brulee torch. I got the gleam in my eye. If these vegetables wouldn't cooperate, then I'd make them rue the day they were ever plucked from the ground. And maybe I just wanted to play with some fire. I had the pyrotechnic devil on one shoulder telling me to do it. But my little angel on my other shoulder, dressed in full on fireman's garb, spoke me down from the ledge. I forged on, ugly vegetables and all. But the stew was good. Hearty. I didn't die over it, but it was definitely very pleasing. I am finding with a lot of the Whisk Wednesday recipes that the French really like subtly behind their foods. I can appreciate that. I'm down with the French. 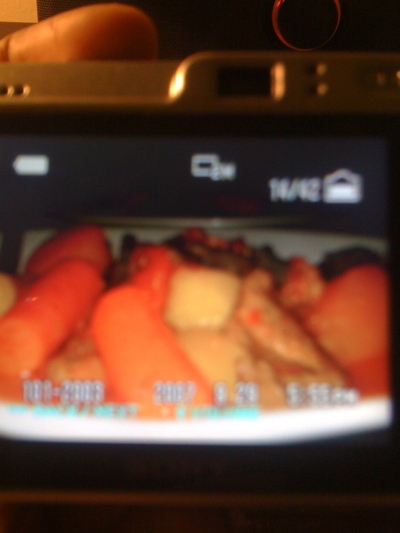 Just to prove that I did it, here is another (blurry) photo from my iPhone. 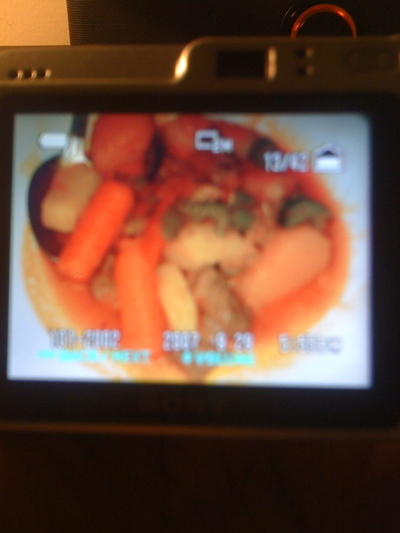 I took a picture of the picture I took on my digital camera. Now I'm off to hunt me some elves. Click here for some REAL Whisk Wednesdays photos! They are some blurry photos. Glad you liked the stew. I agree that the French dishes are subtle. I have been amping up the seasonings a bit. I misplace my upload cord all the time. It's frustrating. I'm sure the stew was wonderful-great intro to Fall. I had a great parsnip au gratin just recently that an English friend made and I didn't like parsnips before. OMGosh! How incredibly frustrating!! I wish I had your excuse though... *Ü* I've cooked and shot pictures but I haven't slowed down to write yet, and I've got a third to get going on too! Egad! LOL!! I know it looks fabulous, because all of your dishes look marvelous! I have faith! Happy Whisking! I can't believe I missed this post! Sorry about that! Glad you were able to make it, and I know you found your upload cable from a later post!